As you will see from the ingredients listed above, Sam uses almond flour in her recipe. Once again I was only going to make half of the recipe and I was not so keen on spending R117 for 350g of almond flour when I only needed 22.5 grams. I cannot believe how expensive this ingredient is. I decided to take blanched almonds and blitz them in my Kitchen Aid blender until they were as fine as the flour available in stores. I am not sure if this worked out cheaper, but it did mean that I don’t have another ingredient hanging around waiting to be used sometime in the far distant future. I consider myself quite adept at making pastry and usually use my touch to get the consistency correct. When testing Sam’s recipe for apple and blueberry jam bars I was not very happy with the feel of the pastry. I thought it was quite sticky, but I didn’t want to mess with the ingredients as the purpose is to test the recipe as is. I ended up squishing the pastry into a loaf pan and even though it was wetter than I thought it should be, the bars were really tasty. We had half the first night with custard, as a dessert, and the rest the following day with cream to go with our coffee. When I make these again I will try and make a drier pastry to see if the texture changes the base somewhat, as these were quite soft. To prevent the bars from burning on top, I covered them after 25 minutes with the foil from the butter. They look absolutely yummy and it comparison to the ones you can buy in a store – yours win! I’ll try to make them very soon :-). Apple and jam bars sound really good to me. Interesting that the dough was really sticky. I would have expected it to be more crumbly going in. Tandy, I like bars like this. And I like the idea of serving them with custard. I have the same problem you have when testing other people’s recipes: have to hold myself back from making changes! 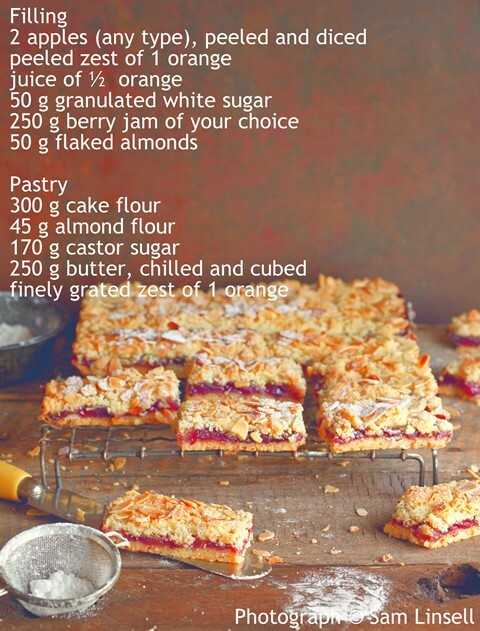 I love these Apple and Jam bars! they look so good! Thanks for the recipe! 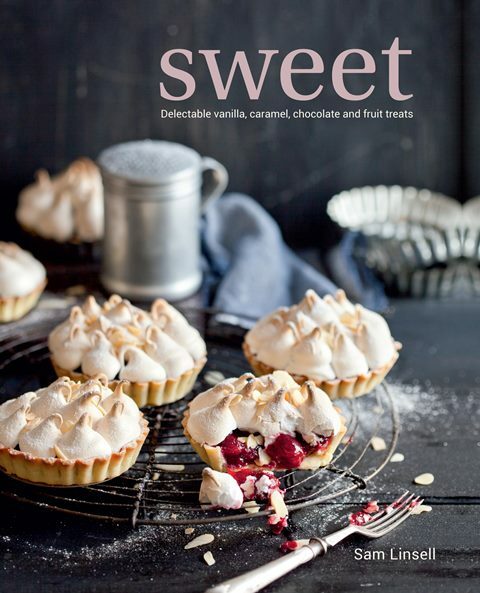 Gorgeous recipe, Tandy and what a lovely book too! Thanks for sharing. You are soooo lucky to have received a copy of this book, Tandy! I’m not really a bar person, but this looks delicious. 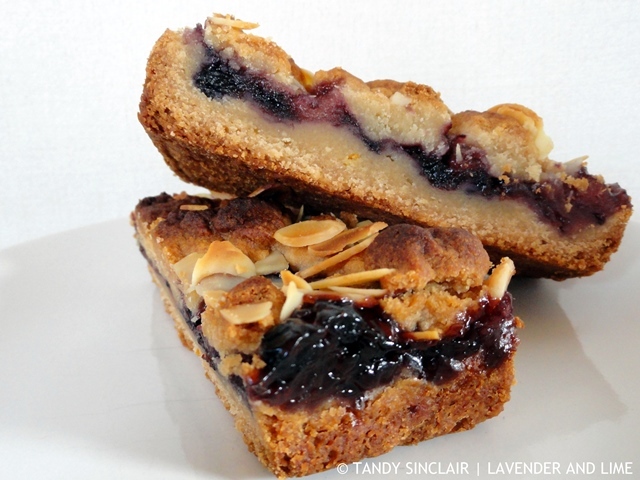 These apple and jam bars look perfect with a cup of tea. I think I’ll use wild blueberry like you did. And agreed, almond flour is so pricy where I live too! These sound very lovely! look yummy too! First, Tandy these bars look amazing on their own – with custard they must have been truly decadent! Love that you blitzed almonds to make almond flour – I do the same with pecans and pistachios and almonds too – it works out cheaper for me. Good idea making your own Tandy! Wet and sticky pastries can be really hard to handle. Almonds are indeed very expensive, the flour is prohibitive here too…We also made a cake this weekend with it, I also was shocked by the price tag! this is so my kind of sweet – sweet but not too sweet. I adore bar cookies with fruit and these look absolutely amazing! Would love to have one of these with an afternoon tea!